I was cleaning up my crafty area and found some of the goodies from the Simon Says Stamp July 2017 Card Kit. I love this pattern paper and am not sure why I hadn’t used it. So today was the day that it got used. 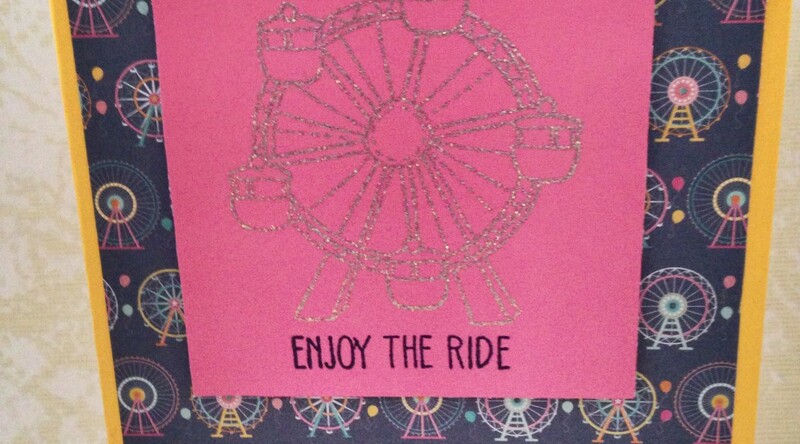 Extra Details: I began this card with a rectangular panel of the Ferris wheel paper and a 3 by 3” square of the pink pattern paper. 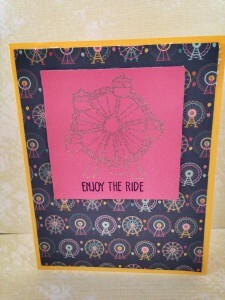 I used WoW Cloud 9 embossing powder to emboss a Ferris wheel on the pink square. I used blank ink to add the sentiment. I layered the pink square on some foam tape before adhering it to the Ferris wheel paper. Then I added everything to a yellow card base. I love the Simon Says Stamp July 2017 Card Kit. 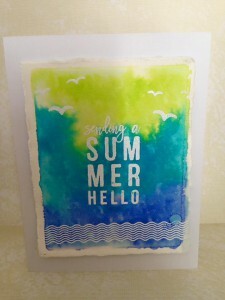 I have been waiting almost a month to play with the bikini die and I’m so excited I finally got to use it. Extra Details: I started with a panel of blue/green patterned paper. I added the wave stamp with blue ink to the entire panel. I stamped the sentiment in Versa Fine black ink. I had a small scrap of the white panel patterned paper left that I didn’t want to waste. 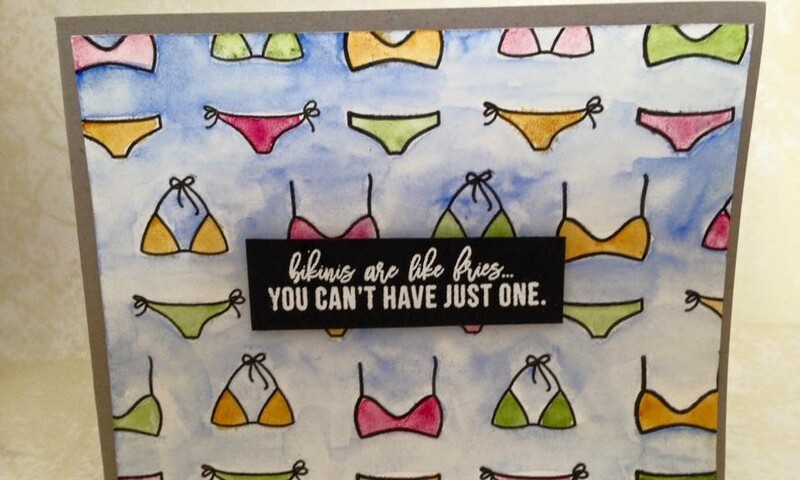 I die a bikini from it. I adhered some sticky backed fun foam to the back leaving the adhesive open so I could inlay another bikini. I die cut the bikini from another scrap of pattern paper and inlayed the bikini in the white panel piece. I adhered the inlayed piece to the wave piece using the sticky backed fun foam. I rounded the corners on the wave panel. 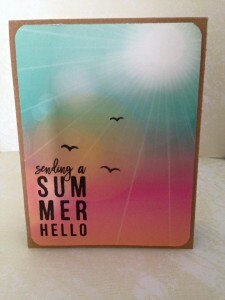 I created a kraft card base and rounded those corners also. Lastly, I adhered the wave panel to the kraft card base. Extra Details: I began with a light blue card base. 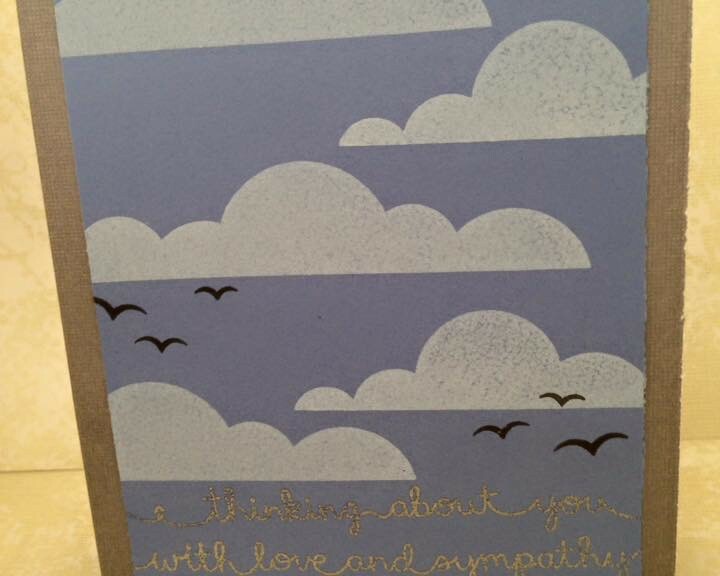 I stamped the clouds in white pigment ink all over the card front. I added the sentiment and lines with Versa Fine ink. 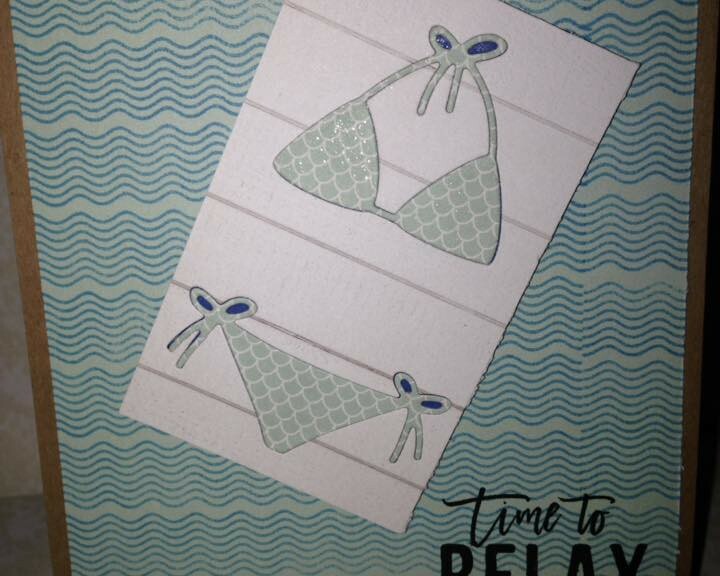 I die cut the bikinis from some of the pattern paper included in the card kit. I adhered the die cuts to the lines using foam tape and some liquid adhesive. I made this card using the Simon Says Stamp July 2017 Card Kit. 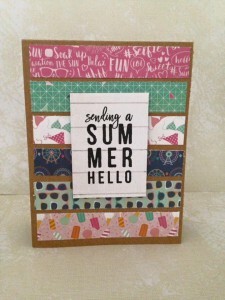 When, I first received the kit, I cut the patterned papers into usable pieces. I have found that if I don’t do this, I hoard the paper and never use it. 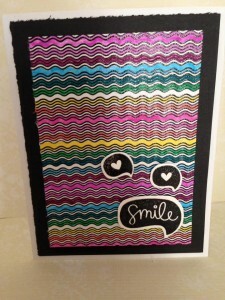 This card was made from the scraps that are left after I cut up the patterned papers. 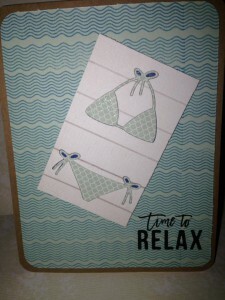 Extra Details: I began this card with a kraft card base. I picked my six favorite patterned papers and fussed with them till I had an arrangement I like. Then I adhered them to my card base. I just estimate the placements, so nothing is exactly prefect. I stamped the sentiment on another piece of the patterned paper, trimmed it down to size and adhered it with foam tape. I have made a few variations of this card design with the different card kits, and I love how each one still has its own special feel. I made this card using the Simon Says Stamp July 2017 Card Kit. I love these clouds. They are a perfect background builder. Extra Details: I began with a dark blue card base. 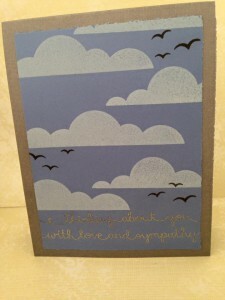 Using white pigment ink, I stamped the clouds right on the card front. Once the ink was dry, I added a few birds using gold embossing powder. For the sentiment, I created a banner from one of the patterned papers. 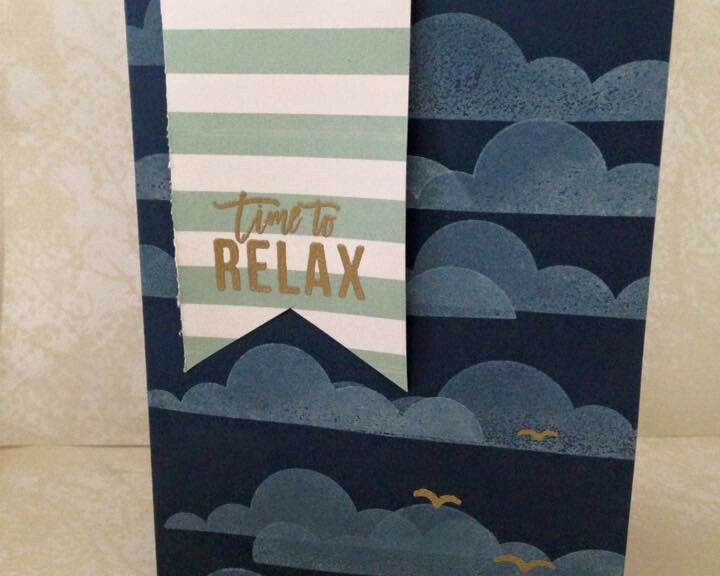 I used the same gold embossing powder to emboss the sentiment. 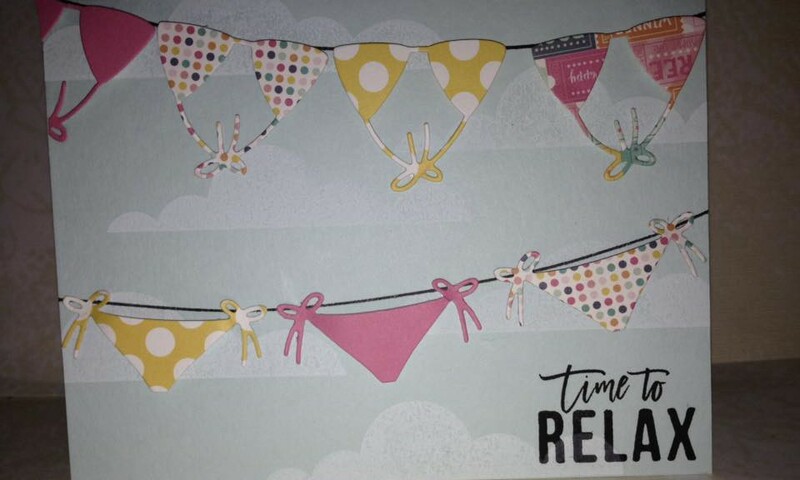 I adhered the sentiment banner with foam tape and the card was finished. 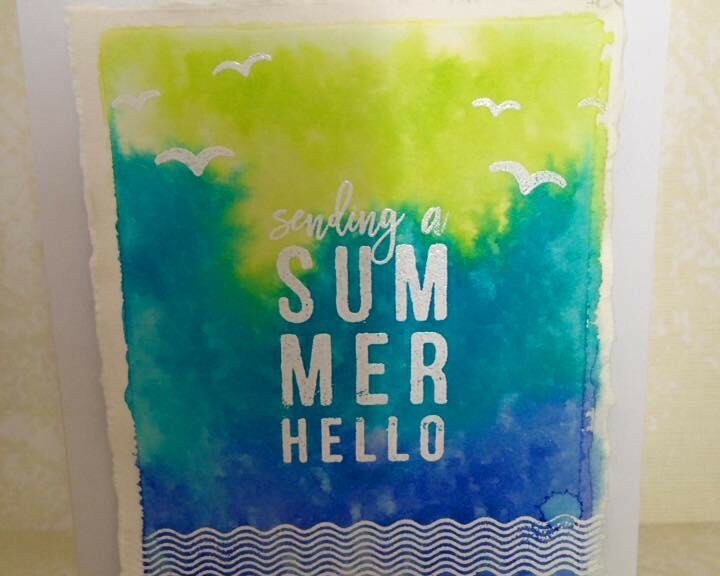 I made this card with the Simon Says Stamp July 2017 Card Kit. I knew I wanted to make this card as soon as the kit arrived. 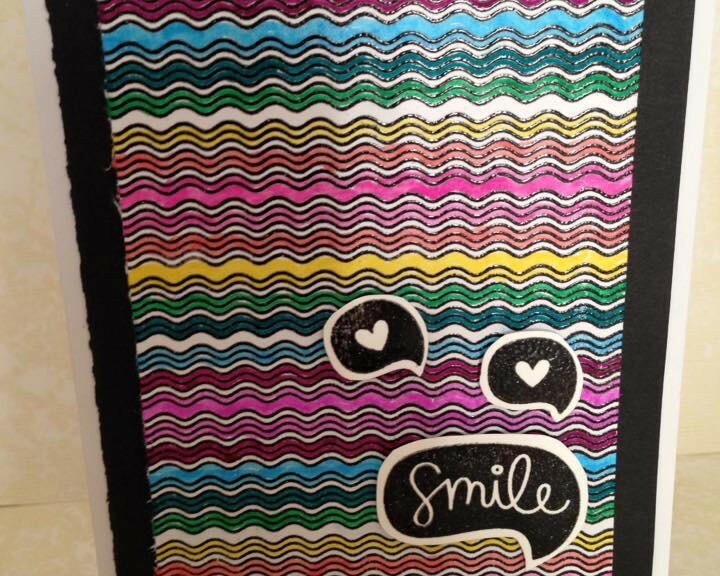 Also, everyone has made this card, but the patterned paper is too beautiful. Using it any other way doesn’t make sense. Extra Details: I began by cutting the patterned paper in a panel that is 4 by 5.25 inches. I rounded the corners for some interest. I stamped a sentiment and added a few birds with black ink. Lastly, I adhered the panel to a kraft card base using foam tape. 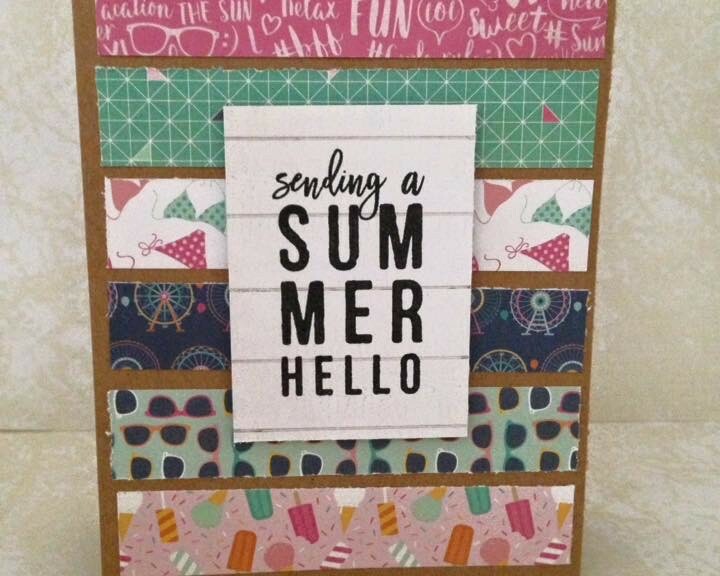 I made this card with the Simon Says Stamp July 2017 Card Kit. I also used the Daniel Smith Water Color Dot Card included in the Simon Says Stamp June 2017. It was the first time I worked up enough nerve to play with it. In the end, I think I still need practice with my water color. 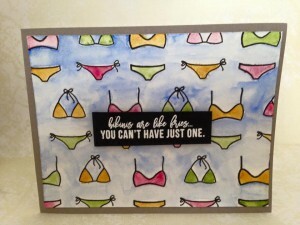 Extra Details: I began with a panel of water color paper that I stamped a pattern of bikinis on. Once the black ink was dry, I used the Daniel Smith Water Color Dot Card to add color to everything. I like the inconsistency of my blue background; I think it looks like water. While that was drying, I made a card base from grey card stock. I also found a scrap of black card stock and white heat embossed my sentiment. I trimmed the sentiment down and adhered it to my water color panel with foam tape. Then I adhered the water color panel to the grey card base. As a finishing touch, I added some clear Wink of Stella to the bikinis. I made this card using the Simon Says Stamp July 2017 Card Kit. I love the stamp set that came in this set. I was also playing with ink smooshing for this card. Extra Details: I began with a panel of water color card stock. I smooshed some Twisted Citron, Mermaid Lagoon, and Blueprint Sketch Distress Ink on my acrylic block. I sprayed some water on the block then pressed it to the water color paper. I let it sit for 5 minutes before lifting the block off the paper. The time allowed the ink to really soak in and created a beautiful background. I let the panel finish air drying before I did anything else. 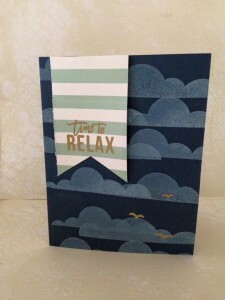 Using white embossing powder, I added the sentiment, birds, and waves to the inked background. I decided to rip the edge of the water color panel for added interest. I scored where I wanted to rip and added some clean clear water on the score mark. After letting the water soak in for a minute I very carefully ripped along the line. I love the result! Finally, I created a light grey card base and adhered the water color panel. I, unfortunately, needed a sympathy card to send a friend who just lost her grandfather. These are my least favorite type of cards to make, but I do like the way this one turned out. Extra Details: I began with a panel of light blue card stock. Using a white pigment ink, I stamped the clouds on the top two thirds of the panel. When the white ink was dry, I added some birds in black ink. I used silver embossing powder to add the sentiments to the bottom of the panel. Lastly, I adhered the blue panel to a grey card base and the card was finished. 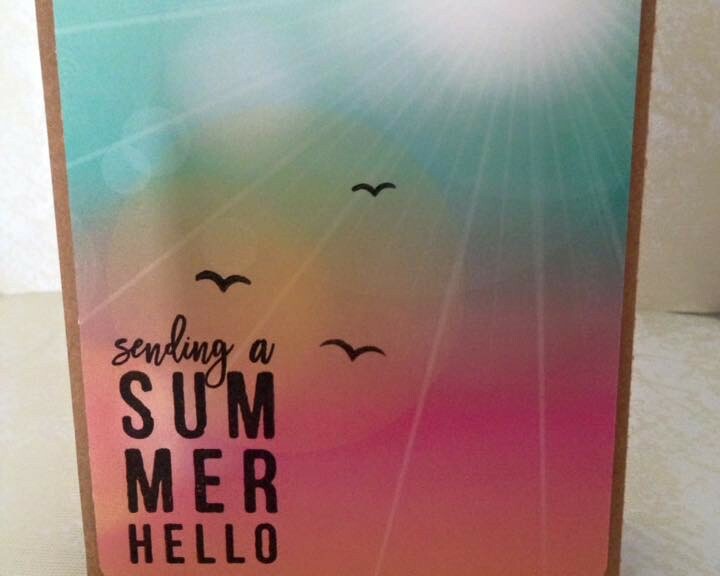 This is a card I made with the Simon Says Stamp Card July 2017 Card Kit. Extra Details: I began by creating a panel of white card stock. I stamped the wave image over the entire panel with black ink and coated it in clear embossing ink. Once the powder was heat set, I used the Crayola Fine Line makers to add color to the waves. I layered this panel on a panel of black card stock before adhering it to a white card base. I stamped the speech bubbles on a scrap of white card stock. I fussy cut them out and adhered them to the card base with foam tape.